Before his 2012 election as governor, Inslee played a central role in making the 2009 post-Great Recession stimulus package a kind of mini green New Deal. That year, he also co-wrote “Apollo’s Fire: Igniting America’s Clean Energy Future,” a book on creating economic growth through fighting climate change. As governor, Inslee tried but failed to pass a landmark carbon tax, and Evergreen State voters rejected a similar measure this past November. He proposed $1.1 billion in investments to prevent the extinction of Southern Resident killer whales. He opposed the extension of the Trans Mountain Pipeline that would bring crude oil from Canada into Washington state. Inslee has also launched an initiative to pardon Washingtonians convicted of misdemeanor marijuana charges. He says the country can get there by speeding a switch to 100 percent clean energy and net-zero greenhouse gas pollution, creating well-paying jobs in green infrastructure and clean technology innovation, environmental justice for low-income communities and communities of color, ending fossil fuel subsidies and holding polluters accountable. 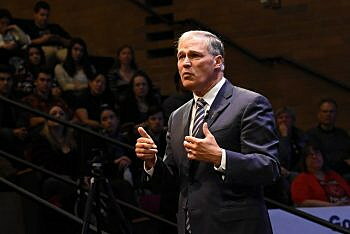 “We are the first generation to feel the sting of climate change, and we are also the last generation that can do something about it,” Inslee said in campaign materials.